Change is inevitable and over the past few years, the Concorso Italiano has had its share of change. The long-established event has spent the last 28 editions being held on Friday of Monterey Automobile Week. This year, and for the foreseeable future, the event will be held on Saturday. By moving the event to Saturday, individuals that currently attend the Quail Motorsport Gathering on Friday will now have the opportunity to visit Concorso Italiano the following day. Since 2009, the event has been held at the Laguna Seca Golf Ranch. Between 2003 and 2007, the Black Horse Golf Course in Seaside was Concorso's home. It offers breath-taking panoramic views of the Monterey Bay with long rolling fairways and magnificently manicured lawn. After having undergone a multi-million dollar renovation, Concorso returned this year to that venue. 'We're very excited about working with Bayonet Black Horse and the City of Seaside again,' said Concorso Italiano President Tom McDowell. 'We look forward to bringing the event back to its roots of sorts, and anyone who attended Concorso Italiano at Black Horse can attest to its natural beauty and expansive views of Monterey Bay.' Along with pristine views, the location is hospitable for those attending and displaying their vehicles. It offers easy entry and exit, especially for the many low-clearance vehicles that were not designed for off-road trekking. Concorso Italiano is a one-day event that celebrates the engineering and beauty of Italian cars. There appeared to be more than 800 vehicles and motorcycles on display with crowds that appeared to exceed the 6000 mark. This year, the feature was the 100 Years of Maserati and the Cars of Zagato. One of the many highlights was a Lamborghini 5-95 Zagato that had never before been seen in the United States. It was flown from the factory in Italy to be delivered to its American owner. Other featured Zagato cars included an Aston Martin DB AR1, Aston Martin V12 Zagato America, Aston Martin DB9 Spyder Centennial Zagato, Aston Martin DB7 Zagato, Ferrari 575 GTZ, Ferrari 550 Barchetta Zagato, and an Alfa Romeo TZ3 Stradale. Never, have so many Zagato's recent creations appeared together. The crowd of Italian car enthusiasts were treated to a drive-by of each car while Andrea Zagato shared his thoughts on their design. Only a handful of automakers have survived a century of business, and Maserati has joined that distinguished list as they continue to charge into the future with a business that certainly appears to be thriving. Leading the way is their new Ghibli along with new models that will likely gain the respect and admiration of many enthusiasts and buyers. Concorso displayed many of Maserati's spectacular Classic GT cars; many of the key models of their production history were on display in the Maserati Centerpiece Display. The list of vehicles in attendance included the 3500 GT, Quattroporte, Mexico, Mistral, Ghibli, Indy, Bora, Khamsin, 228, Merak, Shamal, and GranSport. Although Maserati was the celebrated marque, Ferraris and Lamborghini's were the vast majority of cars on the main field. Sitting in close proximity were the Alfa Romeo's, Lancia's, Fiats, Iso, and De Tomasos. The Alfa Romeo marque was celebrating an anniversary of their own, the 60th Anniversary of the Giulietta. It was one of the company's greatest production cars and captured American automotive hearts forever when the new model landed in stateside dealerships. The various versions of the Giulietta brought innovative styling to an audience that was very receptive. Many examples of the model were on display at Concorso, allowing onlookers to admire and appreciate the changes that occurred over its production lifespan. 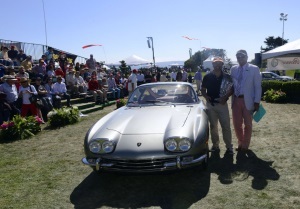 The coveted Best in Show went to a restored 1966 Lamborghini 400 GT owned by Dr. Raphael Gabay. Lamborghini produced just 23 examples of the 350 GT with an enlarged 4-liter version of their V12 and called them 400GTs. The 'new' 400 GT 2+2 was introduced at Geneva in 1966. It was comfortably appointed, a capable cruiser at speeds above 150 miles-per-hour and had two smaller rear seats. The car broadened Lamborghini's appeal as it offered more power and more seating than the 350GT. Even with all the changes for 2014, Concorso Italiano captured and embraced all the cultural elements of Italian automotive styling and displayed them in a tranquil and picturesque setting. Visitors and participants seemed impressed with the location and the date change and look forward to what the future holds for Concorso.